Each year sometime early in the fourth quarter we begin checking our list, even going as far to check it twice, to see who’s really been nice! 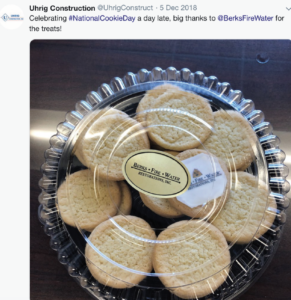 For over 14 years, the team at Berks • Fire • Water Restorations, Inc. has shared one of the most cherished holiday traditions with our customers, vendors and business associates: holiday cookies. From Frackville to King of Prussia, we deliver holiday cookies and candies to show our great appreciation for the ongoing support and strong relationships that we have formed over the last nearly 19 years in business. When possible, we personally deliver the treats to individuals across all of the seven counties we serve, each delivery coming with the warmest wishes and good tidings. To everyone that has received one of these special deliveries, we hope you enjoyed your treats and to those who did not, we look forward to adding you to our list this year. From everyone here at BFW, we say, “thank you!” and wish you all success and happiness in 2019.